Where will we start? Thank you so much for absolutely everything! "J" texted me before her flight and told me how broken hearted she was. "J"'s family were just amazing, "H", her teen, was such a good friend! I participated in a very similar project many years ago, for student teachers. I spent a summer in Boston with both Catholic and Protestant teachers. This project actually helped me a few years ago when my family, namely "J" and her brother "J" were targeted in repeated sectarian attacks on our home. We eventually were relocated through a scheme set up specifically for families who were intimidated through sectarian violence. "J"'s hair started to fall out and her brother developed quite nervous and repetitive behaviour. It was as a participant in a project similar to the Ulster Project that encouraged me to move into another mixed community where my family are very happy! "J" needed this project, and I am very sure it has gone some way to help in the healing process following our experiences that really shook our family up! You are doing truly great work, ensuring that the next generation in Northern Ireland will be open minded and tolerant of diversity. God bless you for giving "J" an experience that will remain with her forever! We are proud of "A" and glad that she is participating so much in the whole Project. It is such a wonderful experience for all the teens with lots of long lasting friendships being made. It is giving them an understanding of different cultures and beliefs both Irish and American and as you have named it, encouraged a Time of Discovery. On a more personal note thank you very much for the iternary you posted on the website along with the hundreds of photos. I wake each morning to check in to see what's new and as soon as I come home from work. It has made the "away sickness" so much easier to handle- I actually feel as if I am part of the whole adventure and know exactly what they have been doing. They have no time to miss us or cold, wet Belfast!! Thank you again and everyone that is involved in the UP for making this a trip that our teens will never forget and welcoming them with love and kindness and taking such great care of them. Hi everyone. Took me a while but I'm here now. Just spent the past hour reading all the stuff and looking at pics. What a wonderful time you gave our teens! And it took all of your time and energy for several weeks. I can't express my respect and thanks sufficiently but please take this as my effort to try. "A" got home and slept for 18 hours, after unpacking his case all over the upstairs landing. Now I really know he's home. He is also taller by a quarter inch on the outside, but by so much more on the inside! We wanted to add our sincere thanks to everyone involved in the project. "A" had a wonderful time and we have heard lots of great stories of your kindness and generosity to her.The photos on the website were fantastic! They kind of involved us in all that was going on and we were often up until the wee small hours because we couldn't wait until the next day to see them!!! Thank you all for your hard work and dedication; it has been much appreciated. Hi to all our fellow NI parents.Yes,we didn't really have the chance to "bond" as our American parents did but maybe through time and the friendships formed with our teens that will change. "M" arrived back in Belfast yesterday at around 10.45am our time (4.45am in Texas) along with 15 other UP teens from Texas and 16 UP teens who had been in Milwaukee. The scene was very similar to that day back at the end of June when they were leaving (tears, hugs, excitement). However, there could be no doubt that there was a marked difference in the 32 kids getting off the bus in July from the ones who got on in June. There was no standing back, hesitating, looking away and not being sure of the next move - instead there was confidence, assuredness and an atmosphere of complete comfort - obviously young adults who know each other inside out and felt very happy to be in each others company. Eventually we got to place all the luggage into the car and make our way home. Even though the guys had been travelling for over 30 hours at this stage, "M" was so full of excitement and conversation - he just couldn't wait to fill us in on all of the experiences that he had had over the last month. We listened and listened with joy - it is so good to hear your child describe what has obviously been a real life changing experience. Claire said to me that evening "he has changed, but it's just like he's even more "M" than he used to be". I think for me it's as though he has had a really positive reinforcement of who he is and it has given him the confidence to just be himself. "M" told me that he definitely felt like he was a better person - he had learnt to look at people and concentrate on the parts of them that he liked and minimize the parts that were negative. As we talked to him during the evening the strength of the bonds that he has developed this summer with many, many people (because it goes so much further than just the other teens) became more and more evident. That all went on hold however at 7.30pm when he skyped W, J & MB and the next 2 and a half hours were spent back in Arlington!! Ken, I really don't know how to convey our deep sense of gratitude to you and all of those involved in the Project for what has happened this summer. The amount of hard work and dedication that goes on within Texas during the hosting month is incredible in itself - but then add the amount of fundraising time and preparation time that goes on all year and it really is staggering how phenomenal a group of people you are a part of. The hard work is not the most noticeable thing to us however. The most noticeable thing is the spirit with which the whole Project is embraced - Leslie phoned us when "M" had left but before he had arrived home. She was thanking us for allowing "M" to be with them for a month. This is a sentiment that was echoing your own words when you visited us in Belfast in March, and yet to me it is YOU (the Project organizers and host families) who we cannot thank enough for taking our children into your country and your families and helping them to develop and grow personally much, much more than I would have thought possible. Please pass on our sincere thanks to all of your support team for making the month so wonderful. To you for the regular mail shots and to those who posted photographs every day to let us see how "M" was getting on I would like to say a special thanks. This information just made "M" seem so much closer to us and really helped to ease the feeling of separation. I cannot believe that there are nearly 4500 photographs on the UPATX site. The hospitality that "M"'s host family showed was absolutely incredible - I know from talking to him that this has been replicated for all of the NI teens, but I just wanted to say that "M"'s experience of Texas family life has been unbelievably positive. He was treated from start to finish as one of the family and everything was done to help him settle in and feel comfortable. The bonds that he has developed with his host teen are obviously very deep and I truly hope but more importantly believe that they will be bonds that will the foundation for a lifelong friendship. 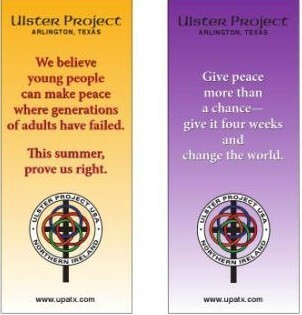 As a family unit we have all benefited from the positive experience that the Ulster Project has provided. I hope that you too have had a truly wonderful and enriching experience this year because I really cannot describe the amount of benefit that the Project is bringing to individuals and therefore society here in Northern Ireland. Please know that you and Beth are welcome in our house ANY time (I'm sure you are welcome in another 15 as well!!) - the love, kindness and care that you have shown to our son over the last month has truly touched our hearts. I hope that the Ulster Project in Arlington continues to go from strength to strength and children from USA & NI have the opportunity to grow together for many years to come. I'm sure that with the talented and dedicated people that you have on your team this will be the case. Howdy guys! Just wanted to say "keep up your good works". We have 2 teens going from our church and many of you on the Project already know C and Ch, my son and daughter. Yes, you do make a difference in our teens' lives. They come home different from when they left, more mature and ready to understand where other people are coming from. Be assured that whatever you do or plan, it is in God's plan for someone to change their lives with your help. May God bless y'all and give you mindful hearts to do HIS will. Love and blessings, J, Bangor,N-Ireland. "...when a young person is selected for the project they are lifted out of their segregated educational system and begin to meet and have fun with young people from across the divide to prepare for the journey. Second, their multicultural experience in the US broadens their outlook on life and the world. Third, and perhaps the best benefit of all, is that after their return to Ireland, the friendship across the ethnic lines and political divide continue naturally for many years....many for life, thus further developing goodwill of lasting quality." "Our daughter has just returned from this years very successful Ulster Project and we would like to pass on our sincere thanks and gratitude for all that our Texan friends did to make the trip such a wonderful and beneficial experience. She had such a fabulous experience as I am sure all the teens had and I know that it will live with her a very long time. The website was fantastic - we checked the photos every day! All of those involved in putting the photos on the website everyday deserve a round of applause for all their hard work!!! It was wonderful for us to see how everyone was getting on. Before ...she... went to Texas we knew very little about the state, but since ..her... visit we are avid Texas fans and have looked up lots of facts about the state on the internet! Could you please pass on our thanks to all involved in The Ulster Project - the committee, parents, helpers - anyone who helped make it such a success. We wish everyone good luck and best wishes for the future of the project - it is very worthwhile and if we can help in anyway this side of the Atlantic we will. We will always remember our Texan friends and if any of you are ever in Northern Ireland we would love the opportunity to return your wonderful hospitality and friendship. God bless." Before we start, I ask you to ponder which of us is Protestant and which is Catholic. In Northern Ireland it makes a difference. Jamie: I remember sitting in a strange unknown environment surrounded by hundreds of similar faces. I decided to keep my head down as I had forgotten most of my forms. The next 15 minutes went by in a haze of boredom. Then we chivied into a classroom with 17 other then strangers. These people meant nothing to me as I silently judged them. How wrong I was. Conor: My first memories are similar to his, yet I never once met Jamie. Instead, I was in a classroom down the corridor in a room full of strangers, one of which stood up at the front, had ginger hair and was quite mental. It was only 1 month ago but some of the people in that room are my best friends and I’m very glad I’ve met them. However, I still hadn’t met Jamie and I wouldn’t yet for a few months. Jamie: On to our first meeting (still no Conor). We went to the greatest pavilion of all time. It was bowling. Little did I know Conor was in the odyssey as well. Another example of even though he was meters away we would never have met. I don’t have lots of memories about that night. Apart from the 3,000 seats as I judged them, who turned up to get into a club that held only 200. That was a lot more interesting than the meeting. Conor: My memories at the first few meeting that I had were different from Jamie’s. I knew instantly that this would be an unbelievable experience from the way the group just clicked. I was happy at those meetings and no part of me thought what would happen one Saturday when I was told that a group that worked so hard and had become so close would split up. I could talk for hours about that night but I’m not going to. But I would like to thank Joe McNamee and Jude Pollock for everything they did for that St. Louis group. At this point I knew I was going to Arlington, but I didn’t really know where I was going from here. Jamie: The first time I met Conor was not person to person but as 6 new people entered our group. It was a mixed bag of emotions. At first I thought it was a bad thing. I thought here that it would be frustrating but on the flip side I got to meet new people including Conor. Throughout the next few meetings, Conor remained anonymous to me. We was at the meeting, we just didn’t really talk a lot. All I can remember is that he played the guitar and played it well. When the date of departure grew ever closer so did my friendship with Conor. We started off tentatively at first I suppose, just extending formalities, names etc. We had one obvious difference: religion…one being a Protestant and one being Catholic. Due to this fact in Northern Ireland we would probably have never met. Yet through a strange set of coincidences, we did. Or maybe it was meant to be. Conor: If it was frustrating for Jamie, it was even more so for me. Coming into a group with its cliques already established and its members nervous to speak to me throughout those early meetings. Jamie and me had little contact with each other. All we had was a nod at the head and an exchange of names; it wasn’t much to go by. Jamie: Our first serious conversation was then about the one sport that unifies Northern Ireland, Football. We spoke about an hour on the subject, especially United’s wonder recovery from 3-0 down to recover 5-3. What a day for all the reds, no matter their religion. That was our first real conversation; the roots of friendship were tagged. Conor: Through out the next weeks, we began to find the similarities and the subjects that brought us together. And having known nothing of each other a few months before I can safely say that there is no person I’d rather be stuck in a an airplane with. Jamie: When we arrived at Dallas, I remember the tiny space between the plane and the tunnel when we got our first taste of the heat. Over the next few weeks our conversations and activities varied greatly from the profound to the not so profound. Any of the guests of the household that night can testify to that. But gradually we grew to be very good friends. Conor: I am Conor, I am 15 years old and I am Catholic. I go to a Catholic school full of other Catholic kids. I play soccer and hurling, a predominantly Catholic sport. I’ve learned to judge people on who they are. I learned to trust that crazy ginger haired woman with my life. Jamie: I am Jamie. I am 15 years old. I am Protestant. I play soccer and hockey, a primarily Protestant sport. I didn’t know many Catholics and certainly wasn’t friends with any. How that has changed. Despite being so similar we would never ever have met. Despite being so near each other, so we arrive at this point, 30 seconds before the closing ecumenical service, sitting in a Protestant church scribbling down the last of the reflections together. Conor: At the end of this, I know he is Protestant. Jamie: I know he is a Catholic. Together: In Northern Ireland that matters and makes a difference, but we both don’t care!